Tlamatini is a company based in Querétaro, Mexico that belongs to Pablo Alberto Pérez Vela, who after working for 20 years in the reproductions workshop of the National Institute of Anthropology and History, he decided to start his own workshop. Pablo Alberto has more than 40 years of experience in the field of faithful reproductions, which guarantees his excellent quality. During the last 20 years, he traveled to Venezuela, Nicaragua and Guatemala offering classes and conferences about the techniques to create pieces. Tlamatini masters the Pre-Columbian-Mexican production art. Its strength as a company is seriousness and punctuality in his work, which is demonstrated when he was working independently as a manufacturer of pieces for the National Institute of Anthropology and History, where he previously rendered his services. Tlamatini is an archeological reproductions workshop that everyday strives to promote the most important archeological treasures of the Mesoamerican pre-Hispanic cultures, these cover from the West of Mexico (Jalisco, Nayarit and Colima), to the South of Central America (Costa Rica). Mexican artisans have won a worldwide recognition, which makes Mexico a country with a very important cultural and productive proposal. Tlamatini takes advantage of this potential to provide these cultural treasures so they can be appreciated for their most meaningful details. 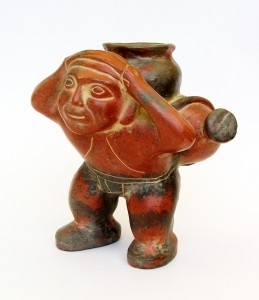 This piece called “The Waterboy” or “El Niño Aguador” in Spanish, comes from the West culture (Colima) and corresponds to the Classic period, which dates from 300 to 500 BC. This is a hollow figure that represents a character with three pitchers of water on the back. Although the ceramic from Colima is mainly dark, it reflects emotions and aspects from the daily life like in this case, the water carrier. This piece belongs to the National Museum of Anthropology Collection. Measurements: 7.84”x6.69”x5.90 Weight: 3.27 oz. Made of mud, clay 44, natural engobes in red/black and yellow patina. According to Náhuatl language translator and interpreter Miguel León Portilla, Tlamatini comes from the Náhuatl “Wise man” who was the person who used to interpret codex and who helped understand the roll of every human in the word. They were like mirrors where people would look at and discover their purpose in the world and their interaction with nature and the gods. “After 20 years working for the reproduction department at the National Institute of Archeology and History, where I arrived as an apprentice and ended as head of the department, I decided to start my own business with the help and support of my wife” founder Pablo Alberto Perez said. Tlamatini is based in Queretaro, where 40 years of experience in the reproduction of Mexican pre-Columbian pieces has allowed the company to sell pieces to the most prestigious museums in Mexico and to participate in several conferences in Latin America. Tlamatini allows us to enjoy and to share cultural treasures, so they can be appreciated by people from all over the world. The appreciation comes from the details in each and every piece. Tlamatini’s workshop of archaeological replicas strives to promote archaeological treasures to the public interested in pre-Hispanic cultures that were developed in Mesoamerica, which includes the western side of Mexico (Jalisco, Nayarit, and Colima), and Central America.